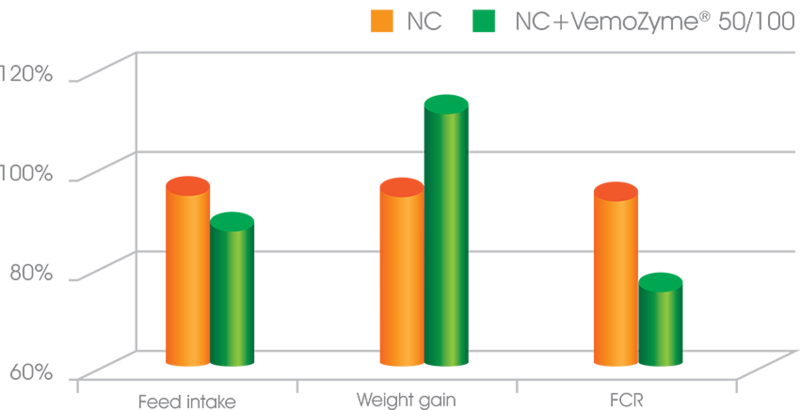 VemoZyme® 50/100 is additive for compound feed, which enhances the natural enzyme system of the animals (amylase, protease, lipase), supplements with the missing enzymes - xylanase, hemicellulase, β-glucanase, α-galactosidase, mannanase, etc., and improves feed digestability and assimilation. Enzymes are organic substances with high biological value and they are of a great importance for the normal performance of the basic metabolic processes in the living organism. In the digestive system of the animals, they help the dissociation of the main nutritive substances coming with the feed to constituents that easily pass through the small intestine wall and become assimilated by the animals. The digestive processes in the animal's body perform and depend completely on the action of the endogenous hydrolysing enzymes. Besides the basic nutritive substances, the feed also contains cellulose, hemicellulose, pectin substances, β-glucans, oligosaccharides and others, which can not be digested by poultry and pigs because of lack of respective enzymes. Not only are the above mentioned substances (known as non-starch polysaccharides) not utilized, but also some of them form viscose mass in the alimentary tract, which prevents enzyme digestion and complete utilization of the remaining nutritive substances. Significant achievement in the field of feed enzymes is the creation of stabilized polyenzyme products that are combination of several enzymes, making them more effective due to the synergic effect of the different enzymes' activities. In compound feed for poultry and swine with higher concentration of wheat, which contains high amounts of arabinoxylans, is recommended the addition of xylanase, for barley and oats - β-glucanase, for peas, soya and maize - a-galactosidase and β-mannanase, for sunflower groats and wheat bran - cellulase. Enzymes are attractive feed additives as they are non-toxic products. Their protein structure ensures easy digestibility from the body and lack of any residues in the meat, eggs and environment. The application of pure enzyme substances, the availability of contemporary technological equipment, specialized bio-chemical laboratory and very experienced professionals give us the opportunity to guarantee the production of high quality multienzyme premixes for swine and poultry with broad scope of action, conformable with the typical raw materials. ♦ Improves feed digestibility and increases assimilation of the basic nutritive substances - proteins, carbohydrates, fats, etc. ♦ Provides better variety of formulations for compound feed and at the same time allows inclusion of rich in fibres and non-starch polysaccharides (celluloses, hemicelluloses, xylans, arabans) cheaper feed - wheat, barley, maize, oats, triticale, wheat bran, sunflower groats and expeller, alfalfa flour, etc. 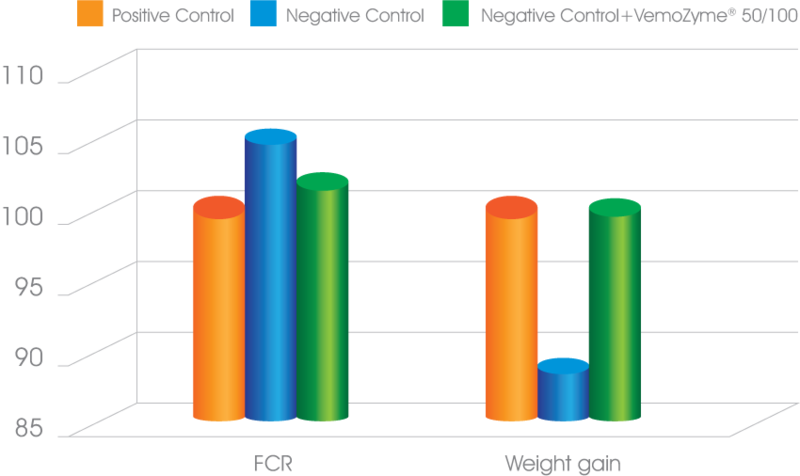 As a result of the addition of VemoZyme® 50/100 to compound feed the live weight of broilers is increased by 4.3% and the feed intake per 1 kg gain (FCR) is reduced by 4.6%. The addition of feed enzymes VemoZyme® 50/100 to compound feed for poultry allows the replacement of 50% of the soy-bean groats in the compound with sunflower groats and ensures productivity equal to the control group. 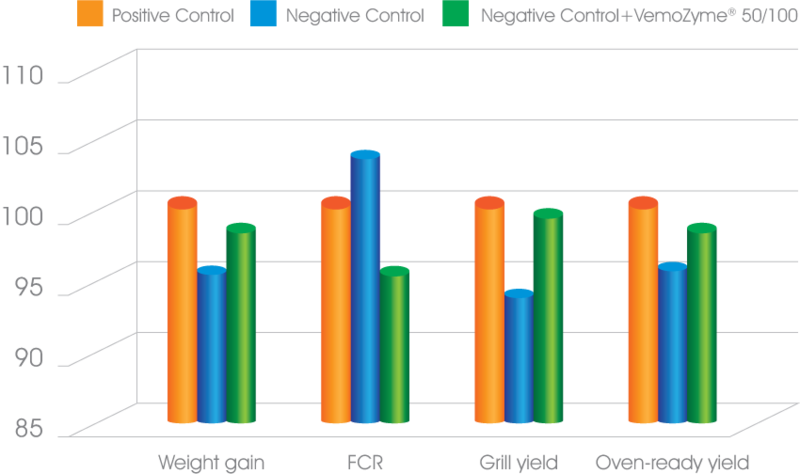 With the replacement of part of the soy-bean groats with 15% sunflower groats and the addition of VemoZyme® 50/100 in compound feed for starter pigs, results in productivity equal to the control group. 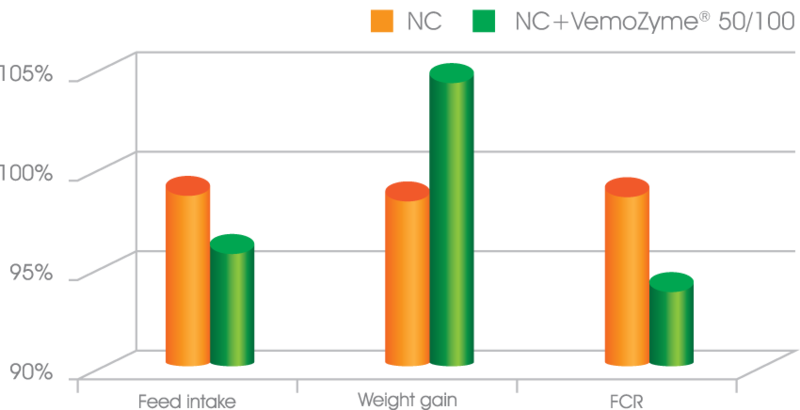 The addition of VemoZyme® 50/100 to the combined feed for broiler chickens grown in industrial conditions, where about 50% of the maize has been replaced by wheat, results in increase of chickens’ weight gain by 5.4%, increase of the butchered chickens grill yield by 5.8%, and decrease of fodder consumption per 1 kg growth (FCR) by 8.3%. The addition of VemoZyme® 50/100 to compound feed for poultry allows the replacement of up to 50% of the soy-bean groats in the compound with sunflower groats and ensures performance equal to the control group. The same body mass in birds is achieved as the positive control – 2154 g and 2168 g, respectively.